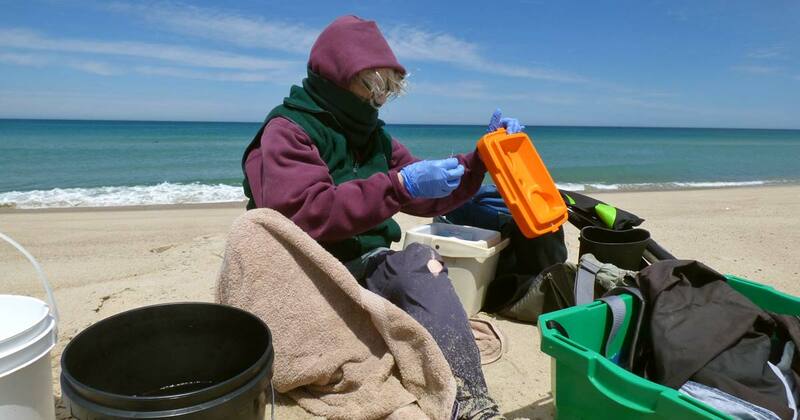 Image above: A water sample was collected about five meters out from the low tide line along the north beach. 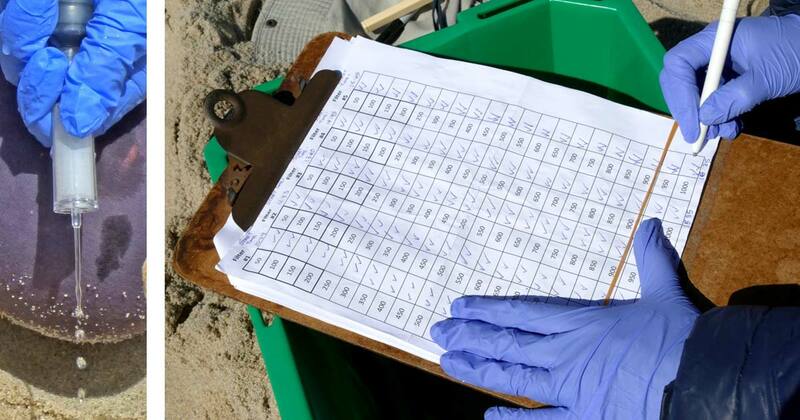 The sampling device was the black bucket, cleaned with 15 ml of 70% ethanol before use. Water was also collected in the white bucket just to eyeball the clarity of the water. On June 21st—summer solstice—samples of ocean water containing millions of microbes were collected from more than a hundred sites around the world. One of these sites was Sable Island, located in the Northwest Atlantic, far off the east coast of Nova Scotia. The event was Ocean Sampling Day 2018, a simultaneous sampling of our planet’s oceans. This is a scientific campaign to gain a more accurate understanding of the world’s marine microbes and their key roles in sustaining ocean ecosystems. Although these microorganisms—including small bacteria, viruses and algae—are invisible to the naked eye, they are vital to the ocean and all other ecosystems on the planet. Among the most familiar microbes are those associated with disease and decay, food spoilage and foul odors. However, microbes are essential components of a healthy environment and have many functions. Marine microbes are found in all marine habitats. They drive the ocean’s major biogeochemical cycles and form the basis of the entire marine food web, producing the food that will eventually be eaten by the world’s marine invertebrates and fish, which will in turn be eaten by seabirds, sea turtles, marine mammals, and us. Microbes recycle nutrients in the ocean and produce atmospheric oxygen. Although microbes make up over 98 per cent of the ocean’s biomass, very little is known about them. Ocean Sampling Day (OSD) was initiated by the Marine Microbial Biodiversity, Bioinformatics and Biotechnology (Micro B3) project, which was funded by the European Union. The Micro B3 project pioneered the approach of collecting data on a single orchestrated OSD. Samples from around the world were taken at approximately the same time, on summer solstice, in a simultaneous and collaborative campaign—a “global synchronized snapshot of microbial life in the ocean”—generating the largest standardized microbial data set ever assembled in a single day. These data would be used in studies of global marine microbial biodiversity and community composition. The first of these worldwide OSD campaigns was in 2014. Dalhousie University, Halifax, registered its weekly sample site in the Bedford Basin as a 2014 OSD site—identified as OSD152. This was one of only two successfully participating sites in Canada; the other was in Nunavut. In 2015, the second OSD was expanded with a citizen science component, “myOSD”. Dalhousie participated, and also served as the myOSD hub for additional sample sites in Canada (Nova Scotia, Prince Edward Island, and British Columbia). Loss of funding limited OSD participation in 2016, and there was no OSD in 2017. In 2018, the European Marine Biological Resource Centre (EMBRC) provided funds to support the continuation of OSD. The Institute of Marine Biology, Biotechnology and Aquaculture of the Hellenic Centre for Marine Research (HCMR, based in Heraklion, Crete) coordinated the 2018 event. Dalhousie, supported by Fisheries and Oceans Canada, participated again with its Bedford Basin site. Although there was no citizen science component in 2018, two of the sites that had previously registered for the 2015 myOSD—Duncan’s Cove and Sable Island—now expressed an interest in 2018. 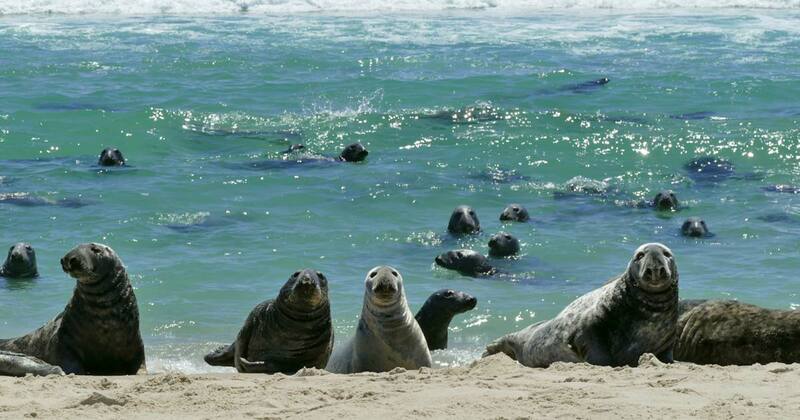 So Dalhousie officially registered both—Duncan’s Cove as OSD217 and Sable Island as OSD218—and provided support. The latter included preparation of sampling kits, dealing with paperwork, and shipping the collected samples on dry ice to Crete. Before we chose our site, we scanned the shoreline, to the east and to the west, making sure the coast was clear—no groups of Grey Seals on the beach or in the water. Microbe-rich gatherings like this are common on the island. 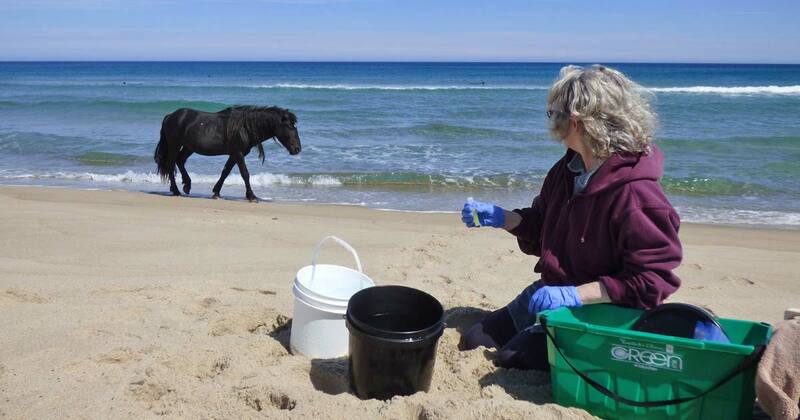 We processed the collected seawater sample on the beach, and had just begun—measured the temperature of the salinity subsample (14ºC), and tested for pH and ammonia levels (8 and 0 ppm, respectively)—when a horse turned up. 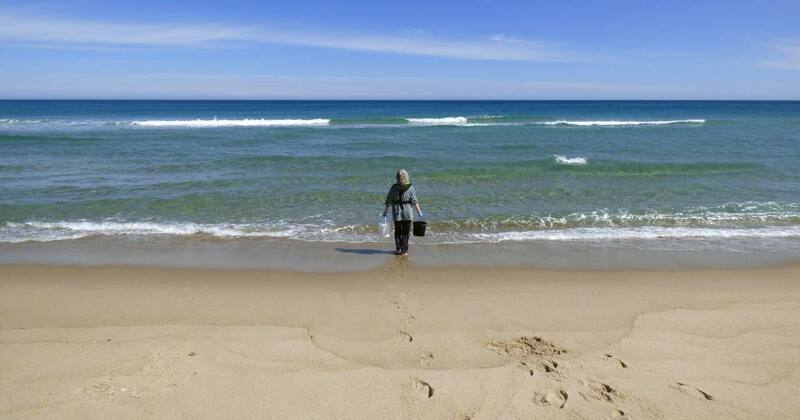 He came down from a nearby dune and walked along the water’s edge. People must maintain a distance of at least 20 metres between themselves and the island’s horses. If a Sable horse approaches, people must move away. Fortunately, this solitary male showed no interest and passed us, heading east. So we didn’t have to pick up our gear and move. Testing for nitrite. 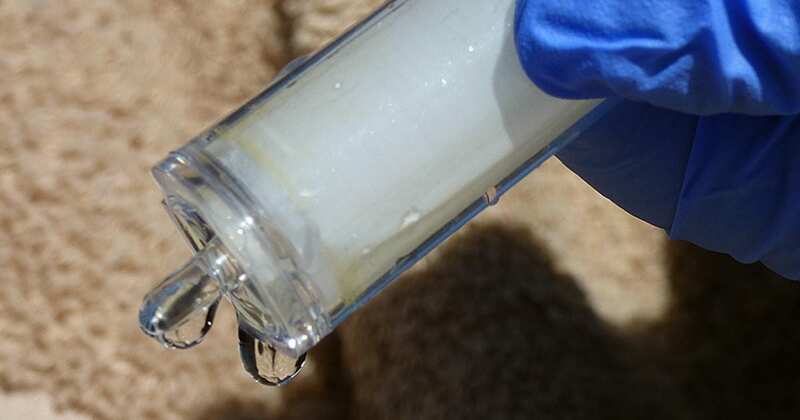 Five drops of the test solution were added to a vial containing 5 ml of the collected seawater. The sample was shaken for 5 seconds, and then the colour was compared with those on the color chart. Result, 0 ppm. 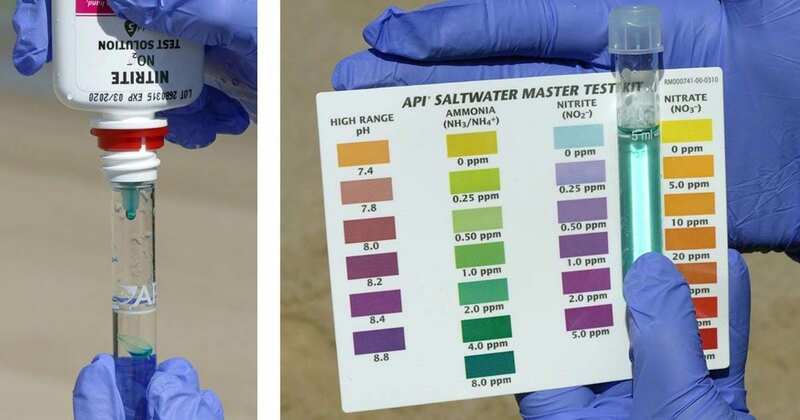 The test for nitrate was similar except that ten drops of two different solutions were added to a vial containing 5 ml of the collected seawater. Result, 0 ppm. 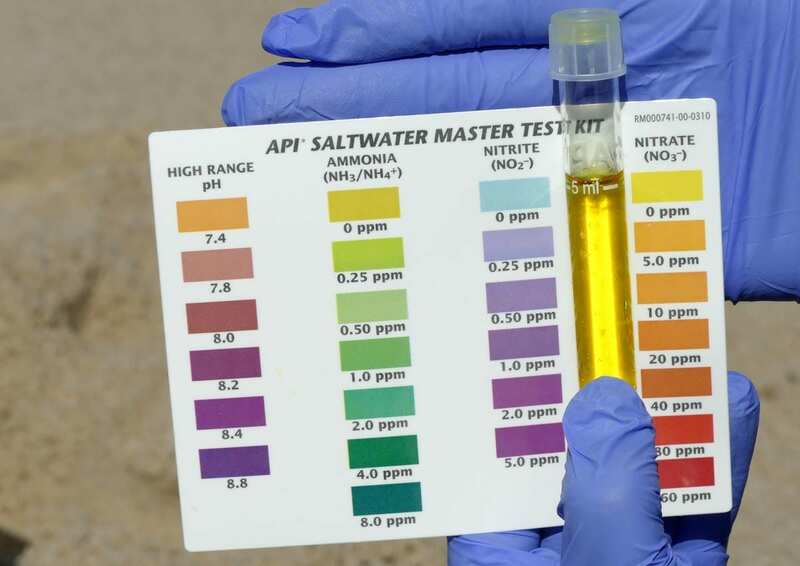 Once the tests for pH, ammonia, nitrite and nitrate were completed, the collection of microbes began. 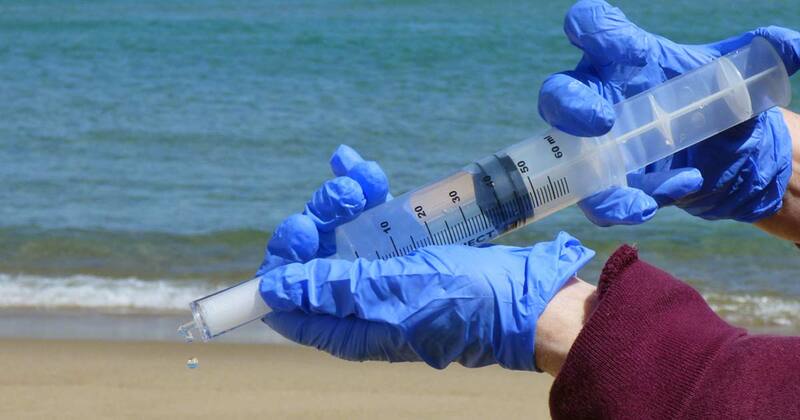 Using a large syringe, 50 ml was drawn from the bucket of collected seawater. Then a small Sterivex filter was attached to the end of the syringe, and the water was pumped through it. The instructions recommended “repeat at least 4 times per filter, until filter shows color, and ideally until filter clogs”. After 4 times (total 200 ml) there was not a trace of colour and the filter was not clogged. So pumping continued. A thin band of colour began to appear in the end of the filter after 1000 ml of water had passed through it. At some other sites the filter would have been clogged with microbes after 200 ml. 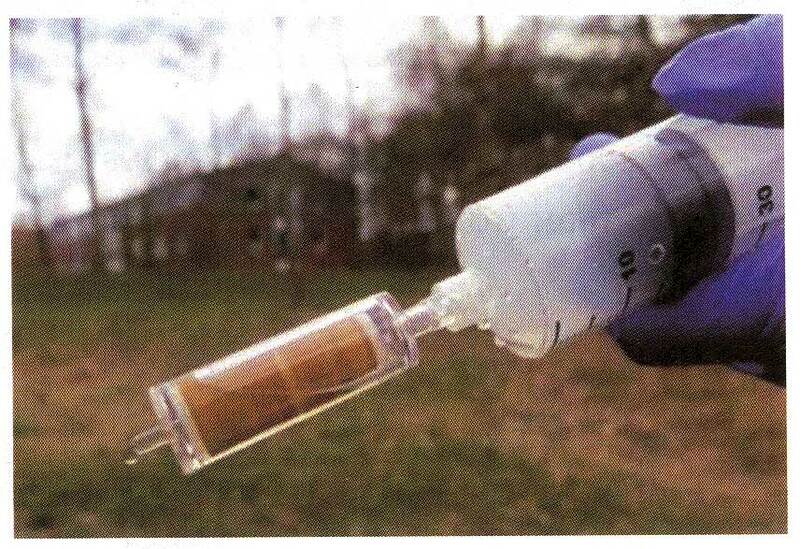 The photo below shows a clogged and mud-coloured filter from an unidentified location (photo source: “MyOSD Sampling Kit HowTo”, version 2.0, April 21, 2015). With only the pale yellowish colour showing in the end of the filter, and no clogging, we kept going until we had pumped a total of 2000 ml through the first filter. Although the colour in the end of the filter was still faint and the filter was not clogged, it had taken almost an hour and we had to get the other four filters done. So the first filter was sealed and placed in a cooler filled with freezer packs, and we started the next filter. Start and end times, and amount of water, were recorded in the log. Pumping 2000 ml of water took between 50 to 60 minutes per filter. When completed, none of the five filters showed more than a slight yellowish colour in the end and none were clogged. After six hours on the beach, the process was completed and the last filter was placed in the cooler. The cooler of samples was kept in a freezer until June 23rd when there was an opportunity to send it back to Halifax on a flight that had been chartered by a group of visitors. The visitors were enthusiastic about helping out, and Jordan Eamer (Parks Canada Operations Coordinator, Sable Island National Park Reserve) ensured that the cooler was safely loaded. Parks Canada’s Jordan Eamer and Bob McLean stand by as passengers onboard the aircraft prepare for takeoff. 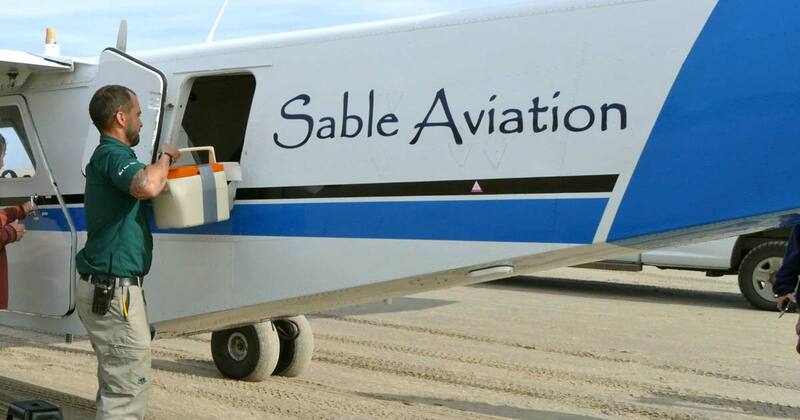 Sable Aviation is the primary air charter service for Sable Island. 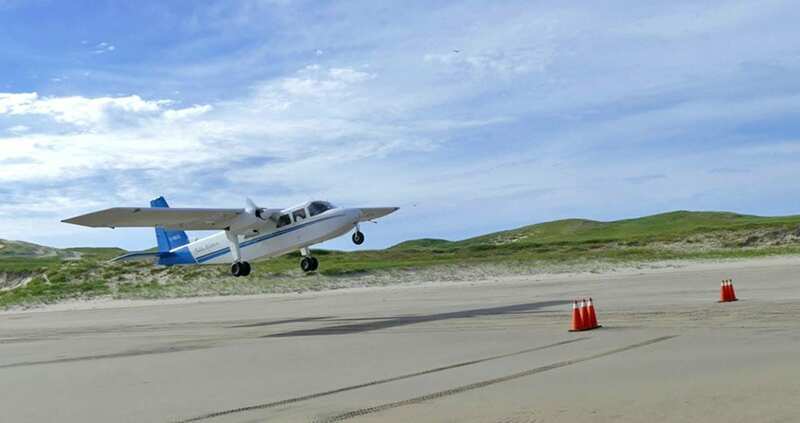 The aircraft is a BN-2A Britten Norman Islander, capable of using short runways for takeoff and landing. 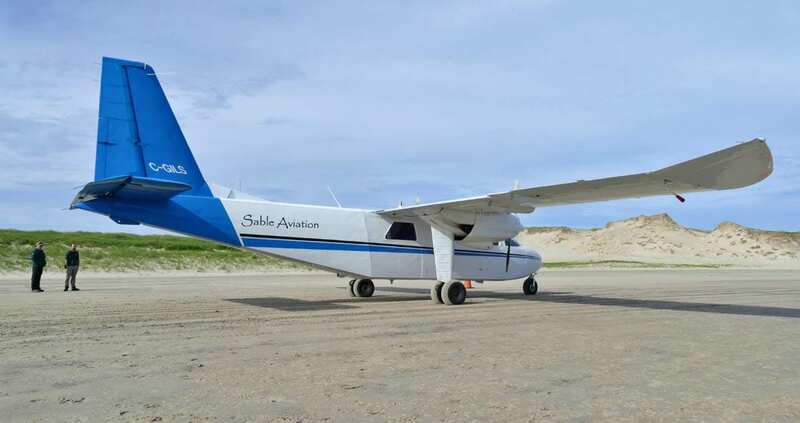 Sable Aviation’s Islander is equipped with large tires for operating on sand. The flight took about about an hour and 20 minutes to reach Halifax. Once there, the pilot Rob DeKelver put the small cooler in a freezer at the hangar. The next day it was delivered to the hub at Dalhousie University. In 2015 we had registered as participants for the OSD, but because of weather-related flight delays the sample kit did not arrive on the island in time. However, during 2018, everything worked out—weather and beach conditions were favourable for both the delivery of the OSD kit to the island, and the timely return of the samples to Halifax. Until recently, technical limitations had restricted research on marine microorganisms to a local scale. With technological advancements and decreasing costs of DNA sequencing, genomic studies of complex biological systems have become feasible on a global scale. It is now possible to effectively process the worldwide collection of microbe samples from the OSD program. Once the DNA extracted from the collected microbes has been sequenced and analyzed, the OSD data are mapped and shared (archived and openly available online to all researchers). These data will contribute to the development of a database of the ocean’s microbes that will catalogue all known diversity of single-celled organisms, and will aid in the discovery of unknown microbial diversity. This database will be used in research on biodiversity and gene functions, and in ecological models, and will be a resource that scientists around the world can use to learn about threats to our environment, such as climate change. Most OSD sampling sites are located in coastal regions within exclusive economic zones (EEZ, a sea zone extending 200 nautical miles from a state’s coastline over which the state has special rights regarding the exploration and use of marine resources). Therefore, the OSD data set provides a unique opportunity to investigate human influences on microbial population ecology. It will contribute to the identification of changing ecological patterns, and will provide information essential to understanding our planet’s environmental vulnerability and resilience. Dalhousie University (OSD152 Bedford Basin) and the Sable Island Institute (OSD217 Duncan’s Cove and OSD218 Sable Island) were the only registered and active participants in Canada for the 2018 OSD. Dominique Gusset sampled at Duncan’s Cove and was the liaison between Dalhousie and Sable Island. Dalhousie intends to participate in the 2019 OSD program at its OSD152 site, and will also support this year’s two sites, Duncan’s Cove and Sable Island, for 2019. Depending on available resources, the Dalhousie team may be able to serve as the hub for other locations interested in joining the 2019 program. Thanks to Julie LaRoche (principal investigator) and lab manager Jennifer Tolman, Marine Microbial Genomics & Biogeochemistry, Department of Biology, Dalhousie University, for enabling the Sable Island Institute to participate in the 2018 OSD; and to Jordan Eamer (Parks Canada, Sable Island National Park Reserve) for assistance on the island.